· Fix any leaking faucets- don’t let that task fall by the wayside! Under construction since March of this year, Vermont Villas will provide 78 permanent apartments for homeless and at risk seniors age 62 and older, who are veterans or disabled. A combined effort of over 11 financial sources and a development team of at least five organizations, Vermont Villas will target homeless senior Veterans with special needs. The project will provide offices for resident case management services and engaging community amenities such as a common kitchen, tech stations and areas for community gatherings, fitness and education. The five story building has 69 one bedroom apartments and 9 large studio apartments. Vermont Villas is a combined effort between Affirmed Housing and PATH Ventures. Opened to the public just this last week, Arbor Green is complete and ready for occupation. 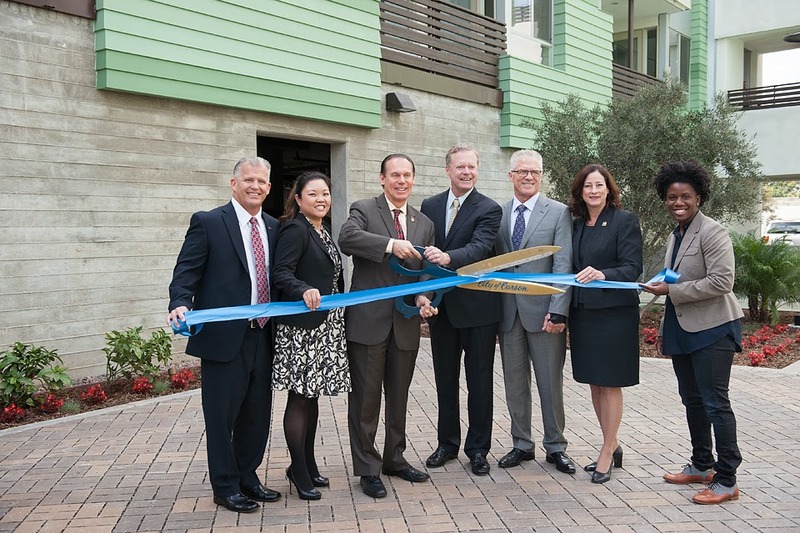 The beautiful new community has been built to LEED Platinum standards and is predicted to be virtually net zero (utilities will be just a few dollars a month) The new community offers 40 one, two, and three bedroom apartments to families and singles earning 30-60% of the area median income. Arbor Green is located in Carson, CA (just south of the City of LA) and is just minutes from a local freeway, public transit, and numerous amenities. On Tuesday, January 14th, we broke ground on our latest project, Paseo Pointe. Located in Vista CA the new project will feature 69 units: 3 studio, 21 one, 24 two and 21 three-bedroom apartment homes. The apartments will be arranged in 2 three-story wood structures connected by a pedestrian bridge atop single level concrete podiums, creating one four-story development. The ground floor of the north building will contain retail space and centrally located management offices, while the south parcel will host a community room and laundry facility. Residents’ needs have been carefully considered during site selection and building programming, ensuring a quality living environment for this community. Building amenities include a computer room, library, onsite management offices, commons kitchen, laundry room and outdoor courtyard with barbeques and adjacent tot lot. The tot-lot is located conveniently within view of the laundry room and other common areas, helping facilitate parental supervision of children at play. Additionally, a large amount of publicly accessible open space is provided for residents and community members alike can enjoy social gathering and relaxation. Paseo Pointe Residences is located within a short walking distance of all necessary amenities, notably a mass transit station to help facilitate independence from the need for vehicle ownership. This new project will be beautiful and will enhance the Vista community. We are very excited for Paseo Pointe which will also coincide with city improvements to the connecting road.